SPIE Past President Eustace Dereniak and Fellow Jim Oschmann were announced as winners of the 2015 SPIE President's and Directors' Awards at the society's annual awards banquet Wednesday night during SPIE Optics + Photonics in San Diego. The awards were announced by SPIE President Toyohiko Yatagai and presented along with several others announced earlier, including the society's highest honor, the Gold Medal of the Society, to SPIE Fellow Nader Engheta. SPIE President Toyohiko Yatagai, at left, presented SPIE 2015 awards including the Gold Medal of the Society to Nader Engheta, at right. It was an honor to receive the award during the International Year of Light. 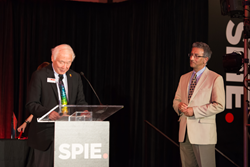 SPIE Past President Eustace Dereniak and Fellow Jim Oschmann were announced as winners of the 2015 SPIE President's and Directors' Awards at the society's annual awards banquet 12 August during Optics + Photonics, sponsored by SPIE, the international society for optics and photonics. The awards were announced by SPIE President Toyohiko Yatagai (Utsunomiya University) and presented along with several others announced earlier, including the society's highest honor, the Gold Medal of the Society to SPIE Fellow Nader Engheta (University of Pennsylvania). Engheta was honored for his transformative and groundbreaking contributions to optical engineering of metamaterials and nanoscale plasmonics, metamaterial-based optical nano circuits, and biologically-inspired optical imaging. In accepting the award, he characterized SPIE as one of his "scientific homes," and noted that this year is the 150th anniversary of the publication of James Clerk Maxwell's electromagnetic theory. Dereniak, Professor Emeritus at University of Arizona (UA), taught at the university's College of Optical Sciences (formerly the Optical Sciences Center and known as OSC) since receiving his PhD there in 1976 until his retirement from teaching last fall. He was SPIE President in 2012, and noted in accepting the award that he has been a member of the society since 1972. He is an internationally recognized expert in infrared detectors and systems whose research has contributed to breakthroughs in medicine, astronomy, and defense. His projects have found application in surveillance aircraft, camouflage systems, and snapshot image spectrometers for the detection of anti-tank missiles. In addition to being a Past President and Fellow of SPIE, he has served on the SPIE Board of Directors and numerous governance and conference committees. Oschmann is Vice President and General Manager of the Civil Space and Technology business unit of Ball Aerospace, and holds a master's degree from UA, where he was named the OSC Alumnus of the Year in 2014. Oschmann has served as chair and committee member for numerous conferences at SPIE Astronomical Telescopes + Instrumentation and SPIE Optics + Photonics, and was symposium chair for the astronomy symposium in 2004 and 2006. Oschmann is an expert in astronomical telescope design and lasers and is responsible for acquisition and execution of Ball Aerospace programs for civil customers that address science and technology development. He has held several key positions at Ball Aerospace including chief engineer and director or manager of advanced technologies and tactical solutions. Prior to joining Ball Aerospace in July 2004, Oschmann served in technical and managerial positions across industry and the science community, including at the Gemini Observatory, the National Solar Observatory, Phase Shift Technology, Sensis Corp., Hughes Aircraft, and TRW. A former member of the SPIE Board of Directors and a Lifetime Member of SPIE, Oschmann serves on the SPIE Awards and Strategic Planning Committees and is chair of the Membership Committee. Oschmann encouraged others to participate in the society and noted that it was an honor to receive the SPIE Directors' Award during the International Year of Light. Alan Lee (LongWave Photonics LLC), Early Career Achievement Award, Industry Focus.